There is nothing more intimate then candles. Therefore, during the most sophisticated and intimate ceremonies of your life you should have your family and friends remember it by offering them one of the many popular candle wedding favors that are available as wedding ceremony gifts. Whatever themed wedding you choose candles can make the perfect table accent, a gift package or as an entire wedding favor in many cases. Most of the candle keepsakes come in votive and tea lights. There are candles for every type of wedding theme, whether you choose a spring time themed wedding, a winter wedding, a fairytale wedding, a love wedding, a chic black and white wedding or a butterfly wedding among others. 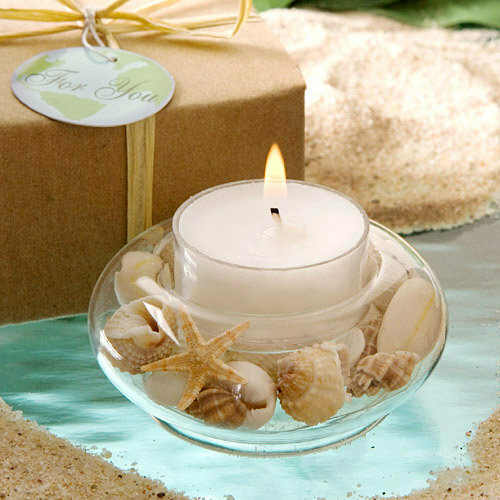 Candles are also very useful for everyday purposes such as for relaxing. This means that every time your guests go to light them they will automatically think of you and your special occasion. Votive and tea lights are excellent wedding reception gifts because they can be for both males and females who will be overjoyed to add these candles to their collection. The best part about them as a wedding favors is that they are some of the least expensive gifts on the market yet they look like they are worth a lot more. If you buy them in bulk, you will be able to purchase many candles at a very low rate. Some rates are as low as $1 while others can become as pricey as $6. This is normally due to their elaborate candle holder. 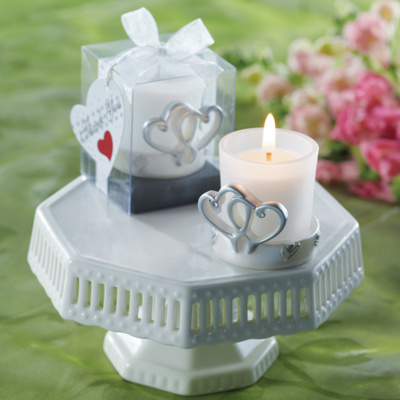 If you want your bride and groom table to feel special on your grand occasion, then you may want to consider one of the most popular candle wedding favors, the personalized votive candles. You can specially order them with their names on them or you can just have candles with their first name initial on them. 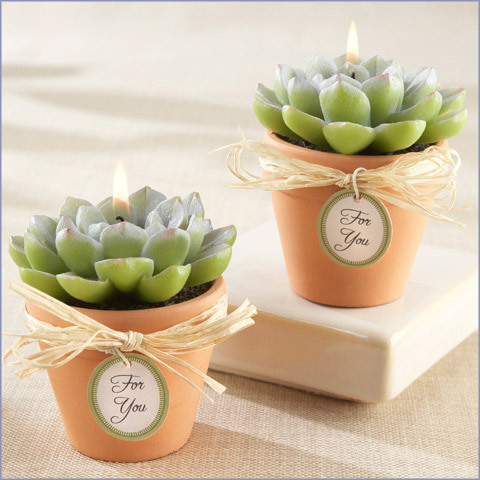 Since you can find candle wedding favors that fit any type of themed wedding, you may want to consider a few of the following favor ideas. There are many princesses out there so for a princess wedding or a fairytale wedding, you may want to consider a castle wedding candle favor, a fairytale coach or a castle in the sand candle. 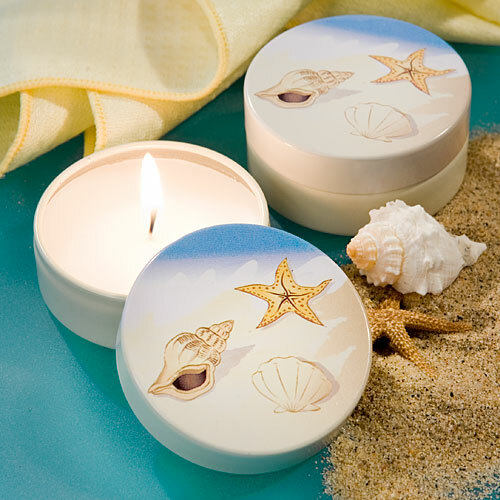 For beach themed weddings try sea shell gel candles, frosted glass sailboat tea light holders, starfish tea light holders, and sea shell votive candles. If you are planning a spring wedding you may want them decorated with flower designs. 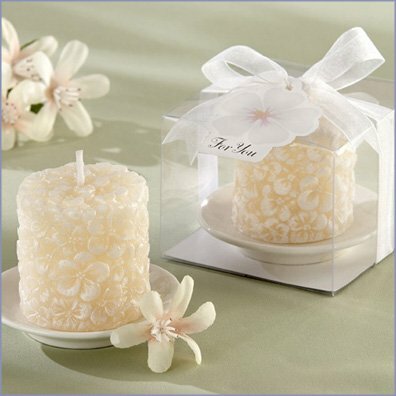 Some popular candle designs are: the orchid, succulent, calla lily and the calla lily tea light holders. 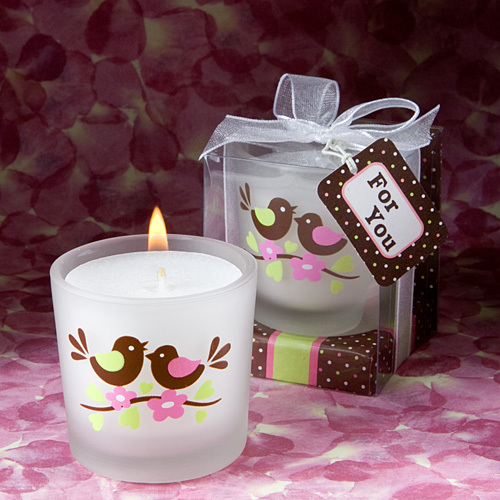 You can also purchase butterfly themed candles, crystal butterfly candle holders and floating butterfly tea lights. Try to purchase candles with holders so that your guests can replace them time and time again so that they always remember this joyous time.